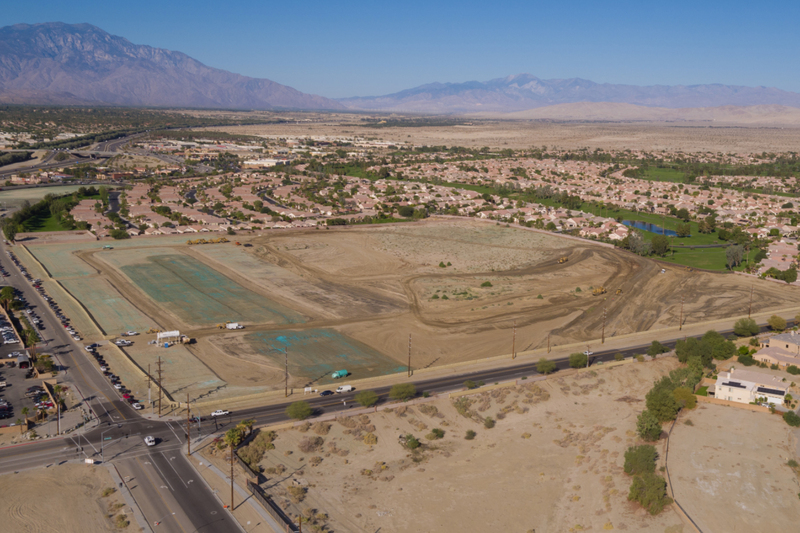 The site for the new active adult community Domani in Palm Desert, CA. Courtesy of the Rilington Group. Nature explorers and outdoor lovers are going to love the newest community under development in Palm Desert, California. Domani – a 55-plus community – has been announced by The Rilington Group with plans to build 202 single-family homes. The community will include a clubhouse with resort-style amenities, low-maintenance homes, and an active lifestyle. Domani will be a prime spot for active adults looking to be close to nature. Located just next door is the Coachella Valley Preserve, while the massive Joshua Tree National Park is also nearby. Construction on Domani’s five model home selections began in summer of 2017 and are slated to open early this year. Active adults interested in Domani will be glad to know they’ll have a wide selection of well-crafted models and floor plans to choose from. These new construction homes will be designed with an Early California-style architecture and range in size from 1,586 to 1,886 square feet. They have two or three bedrooms, two-and-a-half to three-and-a-half bathrooms, and one-and-a-half to two-car garages. Features that are often sold as upgrades will come standard at Domani, including granite kitchen countertops, maple cabinets, ceramic tile master baths, and private courtyards. Upon completion, Domani will feature several resort-style amenities for homeowners to enjoy. The centerpiece will be a spacious clubhouse with a fitness center and several meeting rooms with the latest technology. Outdoors, residents will enjoy a resort-style pool with outdoor patio, private park, and nature trail. There will also be several sport courts, including bocce ball courts and pickleball courts. As the community grows, there is sure to be an active lifestyle with many different clubs and social groups. The community’s proximity to Coachella Valley Preserve and Joshua Tree National Park are big draws for active adults. A retirement in the shadows of one of the country’s most iconic national parks is something many hikers and nature lovers can only dream of having. Besides two large outdoor spaces, Domani borders the highly-rated Mountain Vista Golf Club. There are several other courses nearby, including Indian Ridge Country Club, Palm Desert Resort Country Club, The Oasis Country Club, and Woodhaven Country Club. Besides so many great options near the community, Domani’s location near Interstate 10 allows for residents to quickly get to Los Angeles, Orange County, or San Diego. A day trip to any of these locales will give homeowners a great chance to experience world-class shopping, dining, and entertainment options. There are also several great museums and art galleries in the Los Angeles Area, as well as parks like Disneyland and Universal California. Active adults looking for a warm and adventurous 55-plus community will love Domani in Palm Desert.